The importance of yellow in graphic mediums, including stamps, is well documented. Combine yellow and red to stimulate a feeling of excitement; yellow enhances a more subdued, cool palette of greens and browns; mix yellow with gray and a bit of black to create a crisp, high-tech look. A review of the stamps portrayed in a U.S. catalog using color reveals numerous attractive designs using yellow. It is a very prominent and significant color for many stamps. Figure 1 presents several examples of these wonderful issues. The school room blackboard on the 1972 P.T.A. issue (Scott 1463) is boldly emphasized against the brilliant yellow background. The 2011 issue commemorating the Indianapolis 500 road race (Scott 4530) has an exciting rendition of the yellow Marmon Wasp winning the 1911 race. The 1987 25¢ bee and flower issue (Scott 2281) highlights the shining yellow of the honey bee. The 2007 41¢ Celebrate stamp (Scott No. 4196) artfully combines yellow with red. Some stamps have even been printed on yellow paper, with some of the most notable examples being the 1961 Kansas Statehood Centennial Sunflower commemorative and the various issues of late-1970s to early-1980s Americana series shown in Figure 2.
panes were discovered with the yellow color inverted. Not wanting to create a rarity, the USPS decided to print huge quantities of the color-inverted stamps allowing every collector to have a true error issue in their collection. The multi-color process for U.S. stamps using yellow began with the 1958 Forest Conservation issue (Scott 1122). So, the question is begged as to whether yellow has always been a significant color for U.S. stamps prior to the introduction of the multi-color process. If so, which stamps, and how many? But not yellow. Of the thousands of U.S. stamps issued, with high quality, tightly rendered designs resulting in very attractive stamps, only a very few have yellow as their primary color scheme. The Elusive Color Yellow - How Many Yellow Stamps? Relying on descriptions in the Scott Specialized Catalogue of United States Stamps and Covers, the 10¢ eagle-and-shield issue of the legendary 1869 “pictorials” set (Figure 4) was the first U.S. stamp having yellow as its sole color. color stamps in U. S. postal history, the four denominations of 15-cents and higher. exceptions to the one-color rule of that time period. and special delivery, the list of stamps classified as yellow-only includes the 1869 10¢ Eagle-and-Shield (Scott 116) and the 4 varieties of the 10¢ Washington of the 1908 series (Scott 338, 356, 364 and 381) shown in Figure 5. Some collectors will maintain that absent from this list are stamps commonly identified as yellow, such as the 1913 10¢ Panama-Pacific Exposition (Scott 400) and the 1922 10¢ James Monroe (Scott 562). However, these stamps are purposely not included in the above list of “yellow” stamps because Scott classifies these issues otherwise, as "orange yellow" or "yellow orange". subordinate departments, with Agriculture being one of those departments. True, the various printings of the Agriculture Department stamps range in color from yellow to golden yellow to olive yellow. However, the generally accepted major type of the issue was printed solely in yellow, and that is how it’s listed in Scott’s. "Specimen", as shown in these examples. 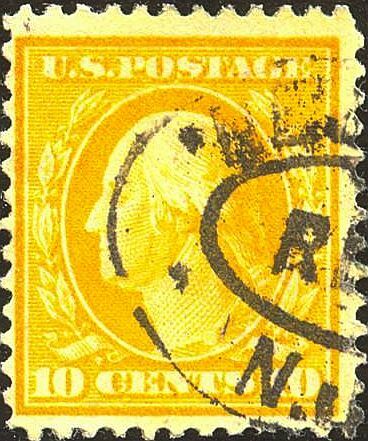 Further understanding related to the color yellow and U.S. stamps could result from research into the shades, hues and variations of yellow stamps as well as orange stamps incorporating yellow in their color scheme. Also, a comparison of yellow used in the major stamp catalogs, online resources, expertizing services and stamp auction houses could highlight the inconsistencies in how colors are identified on some stamps. Yellow has definitely played a significant role in the history of U.S. stamps, whether for regular issues, commemoratives or back of the book items. 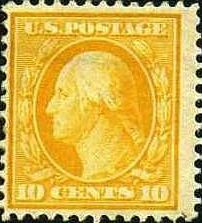 But in stark contrast to the prominent use of yellow with the multi-color process, yellow as the single, primary tint is a most elusive color for U.S. stamps.